I was watching a video on Youtube tonight. 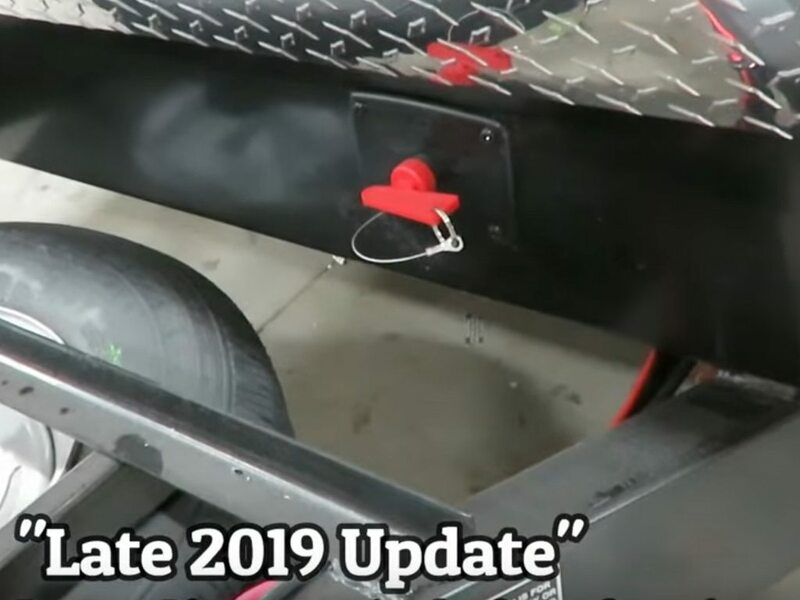 It was a tour of the Forest River Freedom Express plant from December 2018 and it showed among other things some of the changes to the 2019 models. One thing I noticed was they have moved the 7-way trailer connector junction box and the breakers inside the underbelly of the FE models at the front of the frame. Here is an export of an image from the video (the trailer is not yet constructed and the frame has no flooring added). Oddly enough the frame they were working on was a 2019 version of the one I have, a 246RKS. 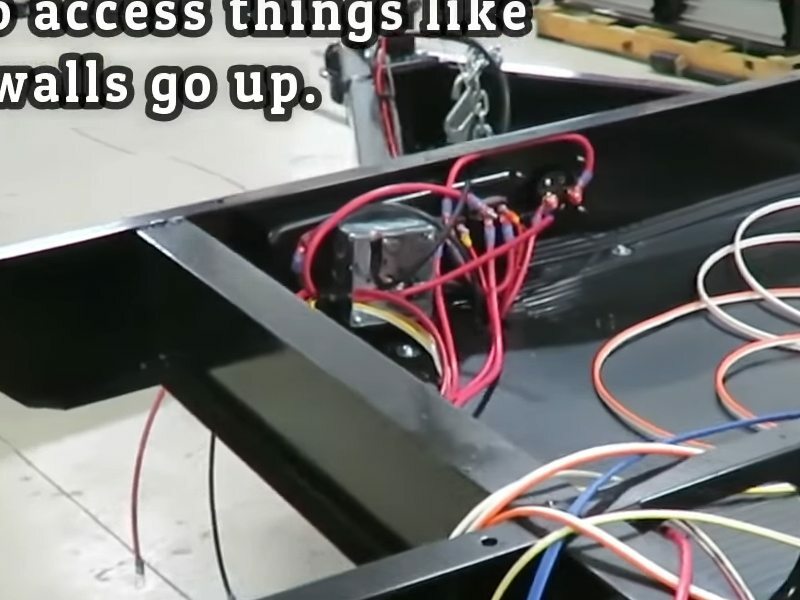 They appear to have added a backer board material as none of the screws for those components are coming through the frame to the front of the trailer/tongue area. I can do this with some 3/4" thick PVC trim board I have which is 6" wide. It would be perfect for screwing the terminal strips and breakers into. The other thing I noticed is the FE models apparently now have a battery disconnect that passes through the from from this same area (you can see the battery connection terminals to the back of the switch in the photo above). Basically the only thing visible outside the frame now is the battery disconnect. You can also see where they now run the battery cables and 7-way into the underbelly at the right side of this photo (along where the tongue angle meets the frame). So here is my question. I'm about to rewire and fix this horror show of a wiring mess and corroded breakers on the outside of the frame in my 2015 FE model. One of the things that I've had trouble with was finding a box that would allow me to enclose all the breakers, terminal strips, 7-way junctions, etc... into a weather protected box that would fit this area and still allow me room to take to cover off without dropping the spare tire or pulling the battery box. This is the horror show I currently have and it's pretty clear why I want to enclose all of these connections in a weather protected box. It does not show in the photo below, but that point where the cables enter the frame is right in the corner where the angle of the tongue comes back (like a reverse 45*) and where the terminal box is, it starts to get tight due to the spare tire. Seeing that the factory has moved all of the aforementioned connections inside the underbelly, made the "ah-ha" light go on in my head. Since my underbelly is still off (waiting on me to find a box to finish the wiring before I button it up), is there really any reason *NOT* to move all those connections inside the underbelly like the factory is doing. I can add framing now so that I have supports for a removable panel at the connections for future service. It would give total protection. It will be fairly easy to do now and actually simplify my project. I can even add a blue sea battery disconnect through the frame at the front (the disconnect knob will be the only component showing). To me this solves several issues and is a clean well protected solution. The wiring in our A-frame area was a mess too with corroded connections. Besides the 4x4 metal box they use being rated for indoor use only and full of holes, some of the marrettes inside it were upside down and full of water. My solution was to move all connections, the mini circuit breakers and fuses into a 6x6x4" weatherproof PVC junction box. It was a bit of a tight fit, but it's all in okay. The connectors are watertight type. I drilled a couple of small holes on the bottom so any water that did happen to get inside could drain out. The connector on the side it a 120 volt outlet for our Viair compressor. Has been good for 3 years now. The other photo was the positive wire from the battery to the circuit breaker. When I touched the wire, it fell clear out of the breaker due to a BAD crimp job at the factory. There's just no excuse for that sort of thing. Nice clean wiring there. 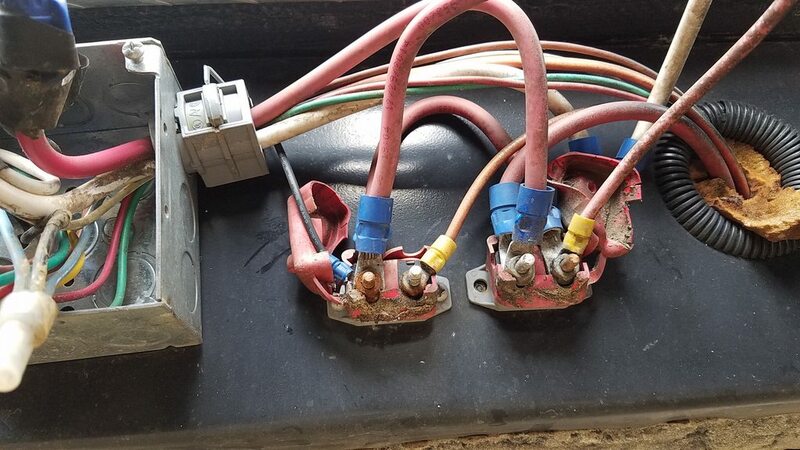 Do you suppose the mini breaker box could be replaced with a WP inline fuse to save space and connectors? Then wire nut the ends together like a typical exterior commercial conduit installation? 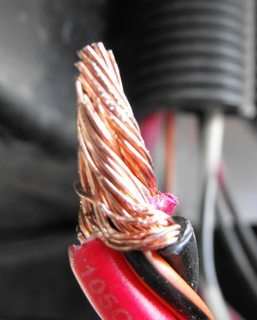 I soldered the wires then used a marrette (wire nut) for insulating purposes. Due to the water that was inside some of the marrettes, the copper strands were tarnished and I dipped them in phosphoric acid IIRC, or might have been muriatic acid to clean the wire before soldering. 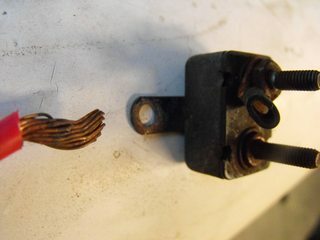 The 2nd photo below is after removed a wire nut and how the factory splices stranded wire. The wire nut was also rather loose. Not impressed. Soldering wires in a potential damp location is a better solution. Wire nuts are rather bulky, and if you solder the wires, a closed end crimp connector should be fine too. The circuit breakers are auto reset. If you replace with a fuse, then you'd have to open the box's cover and see if a fuse has blown. I saw a Lippert wiring diagram once for electric stab. jacks and they showed a fuse and breaker in series. In theory, a fuse would blow on short circuit and a breaker would trip on overload which is likely why they show the two in series. I don't know if the standard mini breaker is any good for tripping on a short circuit, but if you did have a short circuit, you definitely wouldn't want a breaker automatically resetting. I'm just aghast at the way all the TT manufacturers install the mini breakers and connections in the A-frame area which are exposed to the elements , including possibly road salt. BTW, I also wasn't impressed with the grounding in the A-frame. This photo shows the original ground lug on the right. I used two separate ground connectors and screwed them into the frame in 2 different locations so that there is an extra redundant ground connection should one go bad. I used stainless steel screws since plated ones will eventually corrode. I would have put them under the TT in a dry location but the coroplast prevented that. Sounds like your doing it right. 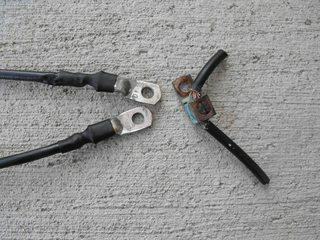 Whats the worst that could happen if the breaker were replaced with an inline fuse. Maybe an overload could compromise the fuse panel? Everything beyond it is on 15amp 12v fuses so they would go right away. https://www.amazon.com/dp/B07KW2JBJ3...9-13293a7f6817 boxes like this !!!!!!!! You can buy PVC junction boxes, with gasketed lid from one of the big box home centers. a 6x6x4 would probably be ideal if you have room for it. The packing gland/strain relief fittings are also widely available, and you can find pretty much any size you want on ebay. 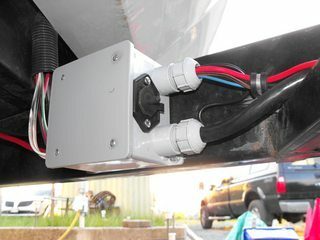 I like working with the PVC screw cover junction boxes on any outdoor installation. You may also like to purchase push to reset circuit breakers, like the ones used on generators. I have a number of them left in 35 amp size, which gives just a bit of a margin. PM me and I'll donate a couple of new, US made ones. The strain relief/waterproof packing nuts, commonly known in the trade as "gotchas" for the name of the special retaining ring furnished by a major manufacturer, may be purchased at electrical supply houses, possibly also at Lowe's or HD, but be prepared to pay a premium price for a premium product. They come in Nylon, aluminum and plated steel. Sounds over all like a nice weekend project that will serve you as long as you wish it to!